Westsound Bank’s troubles with federal and state regulators may stem from high-end residential construction loans one or two former bank employees oversaw, according to the transcript of a conversation with the bank’s president, Dave Johnson. The discussion was the third-quarter conference call Johnson made as CEO of WSB Financial Group, the bank’s holding company. The conversation took place on Oct. 29. I tried to listen to the call live that day, but was denied access. The short story is that Westsound gave out construction loans intended for people who planned to live in the homes they’re building. The loans, though, required only that the borrower state an income, not provide any proof. Westsound offered the loans because Countrywide Financial Group was there as a secondary market, so Westsound could sell the loans. State regulators got nervous about the lack of income proof, then Countrywide pulled the program. Westsound looked closer at the loans, met with borrowers and looked at the projects and determined the borrowers’ ability to get permanent financing was less certain than the borrowers had said. He said there were about 135 borrowers given 146 loans (so at least 11 of those loans were the second or third loans), averaging about $616,000 per home for a total of $90 million. As for fraud, Johnson said the investigation centers on one or two former bank employees and third parties. You can read the conference transcript (a PDF file) by clicking here. Josh Farley has a story Thursday illustrating how many burglaries occurred in 2007 in East Bremerton businesses. “We haven’t had a rash of burglaries like this since 2003 or 2004,” said Bremerton Detective Sgt. Kevin Crane. More than the loss of money and things, a burglary leaves the victim with a sense of being invaded. When it happens more than once, it leaves business owners wondering when the next one will happen. One burglary could be an anomaly, but two puts you on edge, said Rafael Brambila, Taqueria’s owner. “The most frustrating part is you never know if you’re going to get robbed again tomorrow or the next day, or if it’s going to be someone else,” he said. Bremerton ferry riders now have access to the same wireless Internet service Bainbridge and Kingston riders have had for more than a year. Ed Friedrich’s story today gives the details, the costs (It’s $29.95 a month.) and the following piece of information that should make anyone who regularly complains (ahem!) about the Bremerton service feel a little better. 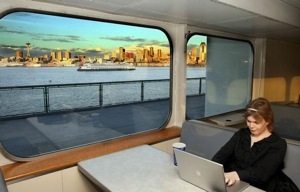 The Bremerton-Seattle sailing, at about 60 minutes, is the longest commuter route in Puget Sound, and it lends itself to Wi-Fi because there’s more time to use it. Subscribers would get more value for their $30 monthly fee than the riders of other commuter routes, which average about 20 or 30 minutes. C’mon Bremerton riders. Smile a little. The people on Bainbridge are paying the same price but get less time online. Mayor Cary Bozeman has said from time to time that Bellingham offers a good example of what Bremerton would like to emulate when it comes to downtown waterfront transformation. So I find the following story illustrative of the spirit Bremerton has yet to capture. This is especially painful for me, because one day not long before Christmas I parked in front of the Sun offices, figuring I’d have to leave within an hour or so. Whatever I was planning to attend fell through and I forgot where I was parked until it was time to leave several hours later. 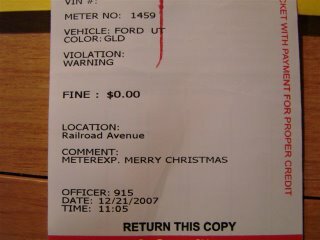 I got the expected envelope on my car with a $25 ticket for the first offense and a $32 ticket for doing it again within 30 days. When I send in my $57 I’ll write “Merry Christmas Bremerton” on the check memo. One — Some of the feedback we’ve received and, frankly, lamented over ourselves is about the frustration of having your blog comments take hours and sometimes days before they post. Especially now that we have immediacy on the comments after news stories, the technical policy on the blogs inhibits conversation. Obviously, that’s a bad thing. So I’ve been in contact with the corporate technical types trying to fix that problem on these blogs. I can’t guarantee it will happen, but I am optimistic. This originated as a policy issue, but now that we have the rapid-fire on the stories, it seems to make no sense. Technically, however, there is a challenge. The stories and the blogs use different software. Those who speak out on the stories are registered users. Those registrations don’t translate to the blogs. So I’m trying to make it work with our Moveable Type blog program. How it would work is that I would be able to mark some of you either as “authenticated” or “trusted.” So if you’ve been lurking for months and don’t comment, but one day get the urge, your comment won’t post right away. If we go with “trusted,” that means we trust that you won’t resort to profanity or some other taboo. If we generally like what you add to the conversations we start here, then we’ll mark you as “trusted.” Everyone else will be a case-by-case basis. I can only think of a couple of you that we’d not add to the “trusted” list. The problem with just letting everything post is we get probably 10-25 spam comments for every legitimate one. I’d rather have you wait than go through dozens of spam to get to the good ones. As for when this gets implemented, I’m hoping we can get this started this week. No promises, though. Two — We have a notification feature on the right side of the screen that allows you to be notified when we post a new entry. More people are getting away from e-mail notification and going to RSS sites such as Bloglines or Netvibes (or maybe some other format I’m unaware of), but if you get the e-mails I have a question. Would you prefer a single notification daily, or would you like us to send you a note every time we post a new entry? Or, would you like me to send multiple notifications, but exclude some of the minor ones, such as the “On Notice” entries? Send me your thoughts in an e-mail at sgardner@kitsapsun.com to weigh in, or leave a comment here and wait hours for it to post. This story in the Rocky Mountain News tells of a prominent Colorado family, three of whom were killed when a truck driven by a Bremerton man hit their Subaru. According to the Wyoming Highway Patrol, (John) Parr was driving west on a slick, snow-blown I-80 about six miles west of Rawlins when he lost control of the family’s 2007 Subaru station wagon. Another driver, Angela Seeley, 42, of Colorado Springs, tried to avoid the car in her Acura SUV but ended up clipping the front of the Subaru. Seeley then hit the back of a snowplow driven by Johnny Woolner, 54, of Rawlins, according to the report. Robert Maxwell, 46, also attempted to avoid the mess but his pickup hit the Acura. Then, a tractor-trailer driven by William Bowers, 58, of Bremerton, Wash., broadsided the Subaru on the driver’s side. Parr, (Parr’s wife Sandy) Widener and their daughter Chase died at the scene. Troopers cited Seeley, Maxwell and Bowers for driving too fast for conditions. Parr founded Colorado Common Cause and was one of those who helped establish sunshine laws in that state. Widener was a writer who started Denver’s alternative newspaper Westword. In the comments after the story I posted the link to, you’ll find criticism of the extra coverage the family received because of the prominence they had in the community, a question why the family’s citizenship status wasn’t included and one anti-prayer opinion. There was no criticism of Bowers. I only mention that because sometimes a community or group or family will get on a soap box after an incident such as this. Maybe it’s too early in the lifespan of this tragedy. In fact, one commenter speculated on how difficult this must be for Bowers. My thoughts and prayers are also with the Truck driver, and his family. This sounds like a tragic accident due to the weather, and I can only imagine the grief the driver is experiencing due to this. Thats the horrific thing about accidents, is that more then one family has been effected by this. I know that the Parr family has suffered the greatest loss, but I don’t know how I’d handle being the one to have ended their lives, regardless of fault. I’m not surprised at the citations, but knowing a little about the workings of things, I have a feeling John Parr would of been cited if he had survived. Interstate 80 is nasty in Wyoming winter. The snow is intense, the winds are high and seeing the road at all is not a given. The roads stretch for miles without signs of civilization along either side. The highway is regularly closed. The Denver Post reported that shortly after the Parr accident Saturday, seven cars piled up in another chain-reaction wreck about five miles away. A house on Fernwood Court, not far from the intersection of Sylvan Way and Trenton Avenue, provides lighting synchronized with music from 91.9 on the FM dial. The Bremerton High School TV class provided three videos of the house on YouTube. This was my favorite. Happy Holidays! I wrote the story later Friday and when I got home I checked the Web to find the comments. By Saturday the story had been published in Germany and Australia. I got an e-mail from a radio reporter in Norway. Monday I called Art Conrad, he said he’d been interviewed by stations in New York and was was scheduled to speak with Neil Cavuto as his last interview. He wished me a merry Christmas. Santa looks down in a display that’s sending a message from Art Conrad’s front yard. Several times I’ve driven by a house on 11th and Highland that is lit like the Griswalds for Christmas. It made me think I’d like to drive around town and capture some of the other noteworthy displays. Perhaps I still will. In the meantime, however, I received an e-mail tipping me off to an odd sight in West Bremerton. The other night I was walking home when I came across a home on Olympic Ave. between fourth and Burwell. In the front window you can see a nicely done tree for the holidays. The odd thing about this house was what was on the front porch and out in the front lawn. On the porch was a life size decapitated Santa Claus holding a knife. 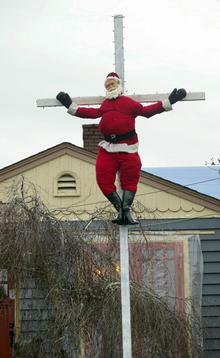 In the front yard is a 20 foot tall cross with another life-sized Santa nailed to it. Thursday night I drove by the house and saw what he was talking about and sure enough it’s as he advertised. Friday I went back to the house, had Larry Steagall shoot a couple photos, talked to some neighbors and passers-by and came back to the office. Later I was able to get in touch with the owner. Surely there had to be a story behind it. There is. Read the story and tell me whether you think Art Conrad belongs on the “naughty” or “nice” list. Originally I planned to post something last night about the city councils decisions on tax breaks, heights and non-motorized transportation and parks. I had technical problems. Following is the short version. Later I will post the whole story. 1. Parks and the Non-motorized transportation plan passed. 2. Heights are unlimited through much of downtown. 3. The council expanded where the eight- and 12-year property tax breaks will go, but not all the way to the watefront. There was healthy debate about that, but ultimately the council decided waterfront property owners did not need the extra incentive. The program was also expanded to apartments. I’ll post more information about the decisions later.